The final KRT Trails Master Plan (KRTMP) prepared by Lake County and Alta Planning is available for public viewing. The development of the Master Plan has been a collaborative effort based on significant input from community members garnered from public workshops, an online community needs survey and working group meetings. Additionally, the Lake County Planning Commission held a public meeting on Nov. 18th, 2010 where it was approved unanimously. This was subsequently present to the Lake County Board of Supervisors at a public meeting held on Jan. 11, 2011, at which time it was also unanimously approved. 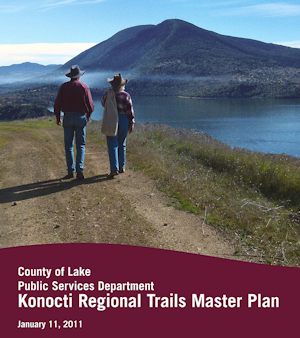 The KRTMP encompasses several sections including: an overview of Lake County; the benefits of trails; the Konocti Regional Trails planning process; existing parks and recreational areas; community engagement process. An extensive policies section compiles existing trails-related policies from the County’s General Plan and other planning documents and also proposes new trails-specific policies that are not already addressed by other plans. Another section addresses conceptual trails and six major study areas while the last section identifies the proposed implementation approach. Multiple appendices contain maps, graphics, and relevant backup data. The final adopted plan is currently available on this Website (below), local libraries, the Clearlake Oaks Senior Center and on CD from the Lake County Dept. of Community Development. For information on the County’s trails development efforts, contact the Lake County Public Services Department at 707-262-1618. Attn: Caroline Chavez, caroline.chavez[at]co.lake.ca.us.